Omair Anjum and Mohammad Shah created the House band Fake Shamans from their mutual love of the underground music scene. The only thing about that scene: it's in Pakistan. "We highly doubt it will ever be legal here," says Omair. "Despite all that, and because of the internet, there's this huge interest in electronic music. People in Pakistan would love to see this scene flourish." Raves are difficult to throw in Pakistan. The conservatism established under General Mohammad Zia ul-Haq in the 1980s still lingers. There's a tension between traditional interpretations of Islam and the country's more progressive, Westernized middle classes. Most music-lovers are forced to throw private parties or take the gigs underground, but Omair and Mohammad say they can feel the tide changing. "Raves should not be the only source for artists to showcase their music," they say. "We are trying to give a better platform to newer artists and give them a healthy environment to perform their art." 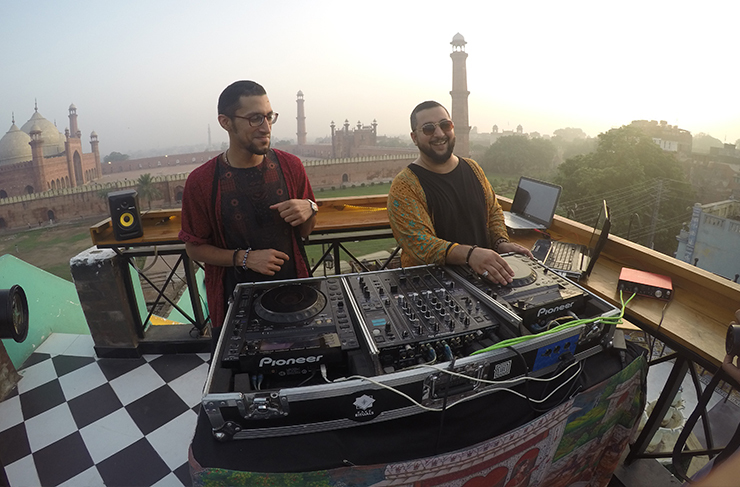 Despite the international success of their residency in Thailand (as part of the 2019 5 Senses Festival), the duo reckons their Pakistani hometown, Lahore, is still their favourite place to play. Looking through their social media, it’s not hard to see why. Fake Shaman's Lahore gigs are set to backdrops of 17th-century Mughal mosques, where their blend of tribal beats and modern mixes feels right at home. It’s here, in the abandoned red-light district of Heera Mandi, where their vision to wrench music away from private parties, and out into the open, really comes to life. "Pakistan has always had a rich background in music," says Mohammed. "Right now, the music scene in Pakistan has rebounded. It's really thriving in all parts with a new influx of artists, bands, producers and DJs." With the spread of the internet, and Pakistan’s booming youth population (64% of the country is under 30), the two believe it's only a matter of time till electronica goes more mainstream. The guys have even launched their own record label, Fake Rituals (you can check 'em out on Spotify here). The idea is to unearth some sweet local talent, creating a new wave of Pakistani sound. “We want Fake Rituals to be a platform for new music producers from Pakistan to showcase their music to the world and other like-minded producers from around the globe," says Omair. Tracks like Pleasure and Siachen capture Fake Shamans' influences perfectly. Think electronic grooves meets eastern elements, with a bone-tingling mix of Shamanic drums, oriental themes and brooding, heavy bass. The duo hopes their sets bring people on a “journey-like experience” and basically make them smile. With their blend of influences it’s easy to see how their gigs could take you to another place. Hopefully a place of tolerance, good tunes and cultural freedom. We'd buy tickets to that any day. Want to learn more about Fake Shamans? Check out their social channels, or listen on Soundcloud.